Firstly prepare the fruit compote. Place the berries in a heavy-based pan with the sugar and orange juice, then stir gently over a moderate heat until the sugar is dissolved. Increase the heat and boil for about 5 minutes until the berries are tender but still holding their shape. Remove the compote from the heat and transfer to a bowl. Leave to cool completely, then cover with cling film and chill until needed. This will last for up to three days in the fridge. 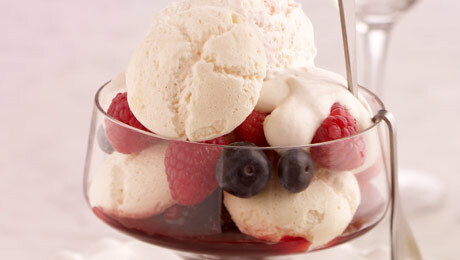 To build your mini meringue mess place 1 scoop of ice-cream into each serving glass. Spoon over some berry compote, then top with a layer of crushed mini meringues. Add some more fruit compote then top with a mixture of fromage frais and fresh cream. Finish with a scoop of ice-cream and a mini meringue, then drizzle the remaining compote juice over the top and serve with saved fresh berries.